Filed under Dog Beds, Dog Behavior and Training, What is My Dog Thinking? Why Do Dogs Destroy Furniture? 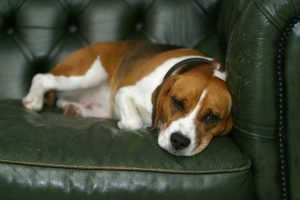 We have all heard the horror stories of dogs chewing through a sofa or chair. Take heart, this behavior is “fixable”. It will take time and patience, yet dogs can learn that furniture is made for people use, and not something to shred. 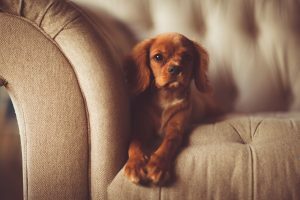 Why do dogs chew the furniture? It is simple – it is something to do when there is nothing to do. Years ago most dogs where breed specifically to do some kind of work. Well, that was years ago, and now our domesticated house dogs spend their time lounging around – especially if the owners are at work all day. They don’t get much exercise as they used to. . .and they are bored. Not enough exercise is the main reason dogs ruin things around the house. Furniture is right there and it comes in a wide variety of juicy smells, tastes, and textures. Remember how important smell is to our canine companions. Often dogs chew things simply because they are there. One lick on the chair leg – hmmmm. . . . that was not bad tasting. Now a lick becomes a chomp. Next thing you know the chair is shredded fabric, stuffing, and splinters. Yet, here is some good news! Usually destroying furniture is just a phase. Sometimes you have adult dogs that continue this behavior after puppyhood; however, mostly this is a problem with younger dogs. Remember, just like our babies, puppies go through a teething. Usually puppies are not big enough to do major damage, it is the adolescents (6 months to 2 years) that are capable of the maximum destruction. Speaking of adolescents, just like our teenagers, adolescent dogs are wild ones. Energy and hormones combined with not enough training, well you get the picture. Most owners at this point wonder what they have gotten into! Just remember that most dogs grow out of this phase of destroying the furniture. NEXT: Why Do Dog Destroy the Furniture – Part 2. Tips You Can Do To Stop This Behavior! Buddy Beds introduces the latest in state of the art memory foam – GEL MEMORY FOAM! This state of the art gel infused memory foam will keep your Buddy cool in the summer and warm in the winter. 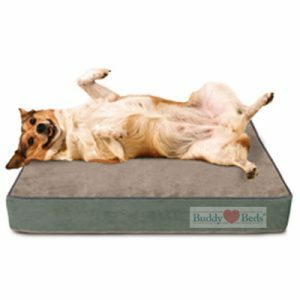 Buddy Beds is known for being the the best orthopedic beds on the market today. Our gel memory foam is the same quality foam used in the expensive, superior quality human mattresses. Buddy Beds memory foam dog beds dog behavior puppies Why Does My Dog Do That?